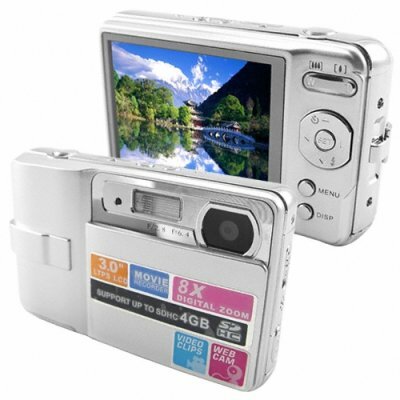 Successfully Added Super Widescreen 5MP Digital Camera with 3 Inch LTPS Screen to your Shopping Cart. Widescreen 3.0 inch LTPS screen digital camera. View your pictures and video clips on the 960x240 resolution screen, and see what a difference such a large screen can make for your photo and video making quality! This factory direct camera also can be used as a PC camera, has the ability to take up to 10 mega pixel digital photos, and an incredible 8x digital zoom to get in really close to the action. Buy a sample for yourself with Chinavasion's no M.O.Q. (minimum order quantity) policy, then after you see how great this model is you can buy in bulk for extra savings and feature it in your store. Note on Interpolation: Please note that this camera takes images in sizes equivalent to 10.0 megapixels. This is through a software resizing process on the camera called interpolation. The image sensor of this camera has a native resolution of 5.0 megapixels.